The other morning as I was diverting myself from writing by flicking through my favourite history magazine I indulged my procrastination further by skipping through Facebook which has become, amongst other things, the modern version of a last cigarette or pressing inspection of navel lint. As I fingered the face of my phone (an almost unconscious action likened by others to the comforting caress of a rosary) I noticed this cartoon posted by a friend. It got me thinking. While I sympathized with the sentiment involved, I felt it was dishonest and messy. Yes, it is sad to see the great feat of engineering and endeavour that was the Space Shuttle Program consigned to a footnote in history, but that’s the way of all great vehicles of state power. The article in History Today I was intending to read before I diverted myself was about the ornate ships of the line that won dominance of the seas for the British in the 18th century. 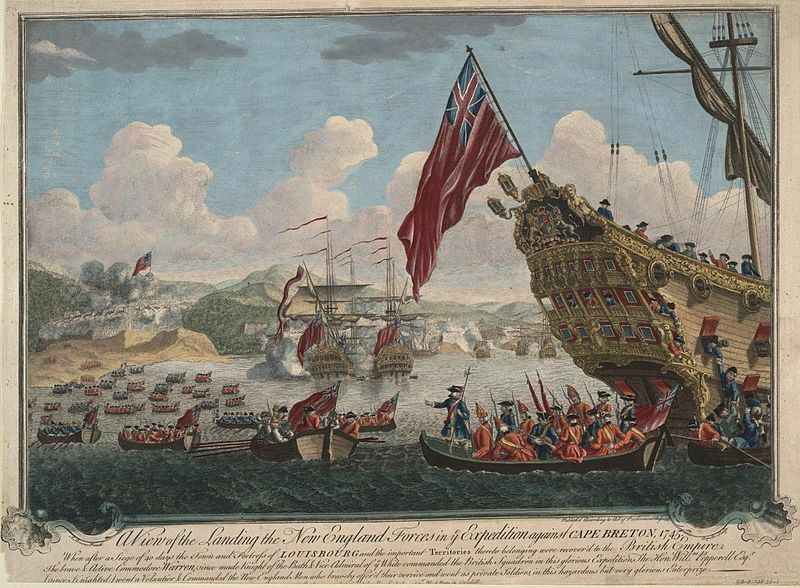 The article started with this engraving of The Capture of Louisbourg in 1745. I could look at it for ages, marveling at the skill and craft of those that made the magnificent ship, wondering what it was like inside, how all the parts went together, how an assault was carried out by those garish and impractically-dressed soldiers and, on a more mundane level, how it functioned day-to-day. But as mind-blowing as these war ships were that wrestled dominance of the seas off the French 250 years ago, they in turn would have been dwarfed by the massive Chinese fleets of exploration led by Zheng He that reached India, the Middle East and Africa 300 years before that. 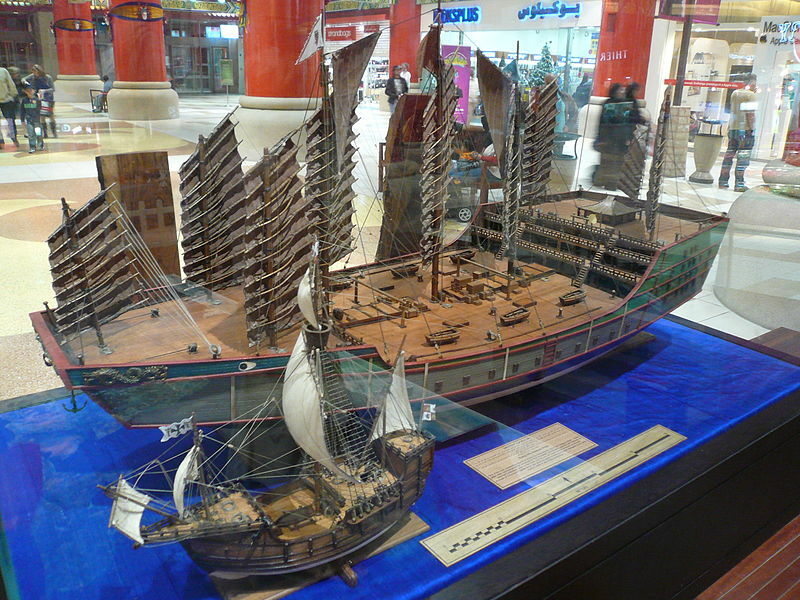 A comparison of Columbus’ ship of 1492 with Zheng He’s of 1405. The Chinese fleets put the much-vaunted European endeavour to shame. They had supply ships covered in soil growing fresh produce while the Europeans were blindly dying of scurvy for centuries to come. The first Chinese fleet had 317 ships and 28,000 men. Europe had nothing to compare until D-Day, long after the Wright brothers took to the air. So what happened to this astounding realisation of humanities’ drive towards trade and exploration? Like all such undertakings of incredible cost and organisation they relied on political will and state funds to continue (just like the shuttle programme) and, as always, times change, as do priorities. The fleets of Zheng He ended when a new emperor came in and eunuchs like Zheng He lost power to the Confucian bureaucracy. Am I lover of war and arcane technology? NO! to the former and YES! to the latter. But more correctly, I am a lover of history and pre-history, knowledge and the unknown. A natural philosopher, if you will (to use a term from the 18th century) who sees science, the arts and religious belief not in opposition but as part of a continuum. I am no follower of the Manichaeism that so infects the present discourse in politics and the media. For me, the world does not divide neatly into black and white, like it does for some. It is full of colour. And even when it gets dark, there are always shades of grey, contrasting intensities of darkness, something glowing in the corner to be inspected. There can be no loss that offers no gain. No gain that does not involve some loss. What has the space shuttle got to do with war and philosophy? A lot. I can never celebrate war. Edwin Starr was right to claim war was good for ‘absolutely nothing’ in 1969 as the groovy pop culture stance was needed in the face of the Vietnam War. But it was a song of the moment and the greater truth is that while war achieves very little that is good no evil passes without the opportunity for some advantage to society. 1. Good for certain interested sections of the economy of the victors. 2. Drivers of scientific research and innovation which can have applications outside the military. History is littered with examples of 1. In, fact, I was talking to a military contractor the other day who said that the US economy needs a large-scale war every 15 years to stay afloat. An easy statement to make but he had just spent the last 15 years helping organize the clean-up of mines left as a result of the various imperial adventures in South East Asia in the ‘60s and ‘70s. As always, it is women and children who face the relics of this aggression while they go about the mundane tasks of seeking water and wood. The producers of the land mines and the politicians who demanded their deployment, as well as the combatants who placed them in the ground where they remain till this day, are all absent from the clean-up. No glory to be had there. We also talked of the present absurdity of the US Army being forced by politicians to take orders of new, more technologically advanced tanks when they are quite happy with their present ones. Naturally, examples of 2 are a little less depressing (I use that small qualifier not because I live in a land where understatement is an understatement but because the innovations come on the back of making it ever-easier to kill people). Florence Nightingale pioneered nursing care in the inanity of the Crimean War not for the benefit of civilians, but to stop soldiers from dying from the wounds and disease that were seeing them off at a greater rate than the enemy ever could. After they were healed they were sent back to the task of killing the Russians in an aggressive, pointless war far from home. We continue to benefit from that awful situation with modern health-care. New Zealander Sir Harold Gillies, ‘the father of plastic surgery’, pioneered facial reconstruction during The Great War (the one fought to end all wars) so that those who had put themselves on the line so there would no more need to fight could be better accepted back into the society of those who, for whatever reason, had not made that sacrifice. The predicament of the half-faced veteran, Richard Harrow, in Boardwalk Empire says a lot about this appalling situation. Sir Archibald McIndoe (also from Dunedin) worked for his cousin, Gillies, in the 1930s, learning the trade before achieving medical breakthroughs working with RAF burn victims (the famous Guinea Pig Club) in World War II. 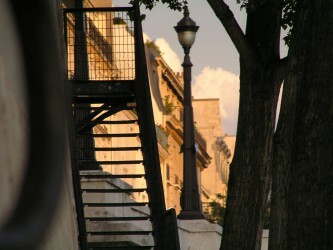 Another great benefit derived from World War II is international travel. Jet planes were relatively ineffective during the war but the technology was soon parlayed into the cheap travel we enjoy today. It still amazes me to think how far air travel has developed from the Wright Brothers’ first flight 110 years ago. But to link their achievement on a continuum with the space shuttle is disingenuous. An apple and a pig are food for some and may even be found in the same shop or dinner plate. But the one does not proceed from the other. Likewise, powered flight is similar to space travel in that they both leave the ground, but the shuttle programme was born of a rather different impulse. We all know that the Wright brothers weren’t the first to imagine how we might fly. There had been countless attempts throughout history, amongst them New Zealand’s great challenger from Temuka, Richard Pearse, who some still claim to have beaten the Wright’s by 9 months. 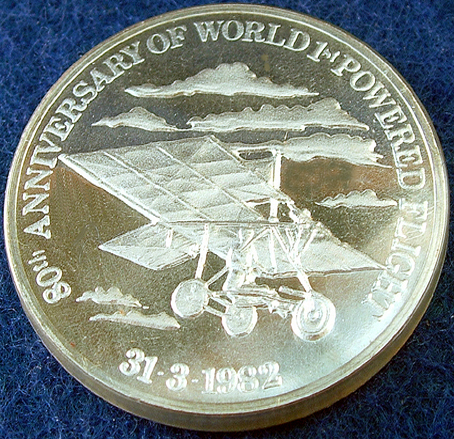 Medal struck by NZ Mint claiming Pearse flew first. The Wright Brothers were bicycle makers working away by themselves while the U.S. War Department (yes, the War department) and the Smithsonian Institution combined resources and scientific expertise to ‘conquer the air’. How did the Wrights’ compete with that? There’s a fascinating and gripping book about it called ‘To Conquer The Air’ by James Tobin. “…we don’t have much money, so we have to think”. I must mention that, despite popular opinion, Rutherford didn’t split the atom. He cleverly, and cheaply, worked out an experiment to demonstrate what was inside. If the atom had been split then Manchester would have gone *bang! * well before the ‘80s dance craze. 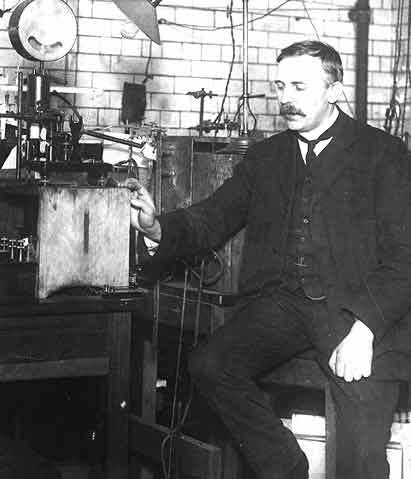 Rutherford and his “Number 8 Wire” gold leaf experiment that ‘split the atom’. The Wright brothers won the race against the War Department et al. because, like Rutherford, they employed the imagination and skill that the state, for whatever reason, seemed to ignore. It wasn’t mere chance they got there first. In contrast, the race into space was a very different game. It was born directly of the ballistic missile technology developed by the Germans and realised in their V2 terror attacks on London. V2 on its way to London. 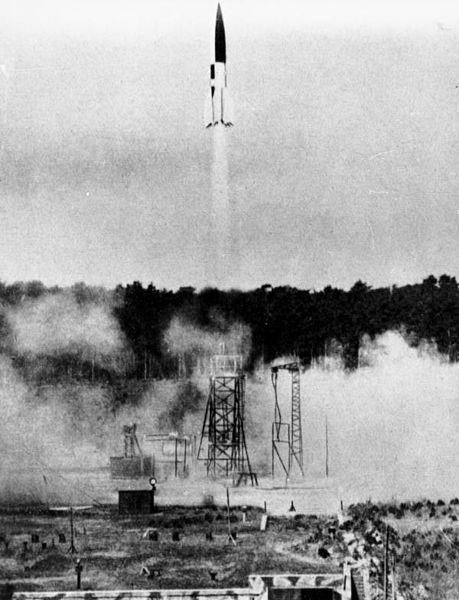 The V2 was the first rocket to go into space. 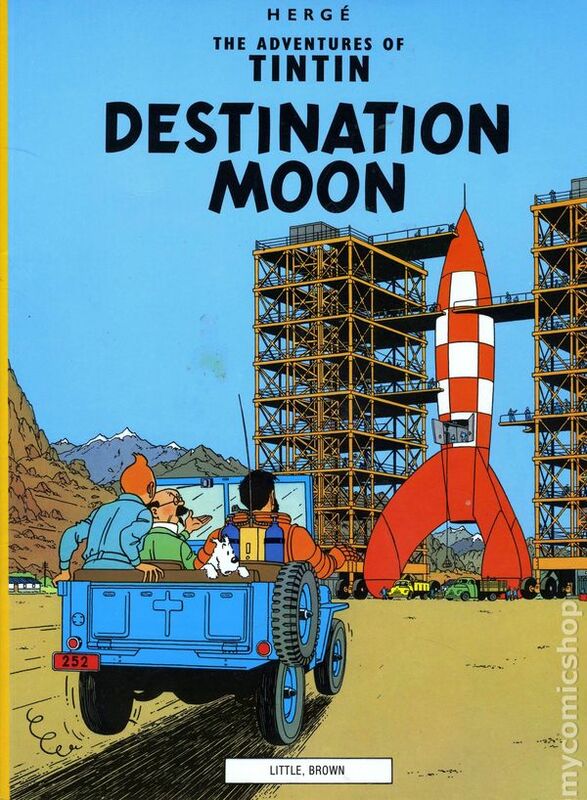 Fans of Tintin will recognize its form from ‘Destination Moon’ published in 1953. We’re going to the moon! While these ‘terror weapons’ (as Hitler called them, in his hodgepodge German accent) killed many Londoners a much greater number of slave labourers and concentration camp ‘workers’ died making them. When the Allies overrun the launch site at Pennemunde they grabbed the technology and the developers in order to initiate their own ballistic missile programmes. Amongst them was the leader of the V2 programme, Wernher von Braun who was secretly taken to the U.S. where he ended up starting the Space Program which became NASA. Yes, it could be argued that he should have stood trial at Nuremburg, not so much for killing the Londoners, but for the deaths of the slaves and concentration camp victims forced to build his terror weapons while hidden deep in dangerous caves, but isn’t it best to be pragmatic and take advantage of a bad situation? Like a lot of what happened at the end of WWII, motives were driven by concerns about erstwhile allies, soon to be regarded as enemies. The Americans were desperate for the Soviets not to get hold of the technology (that the Soviets developed their own space programme out of the bits and pieces left scattered at Pennemunde is testament to a great resourcefulness). 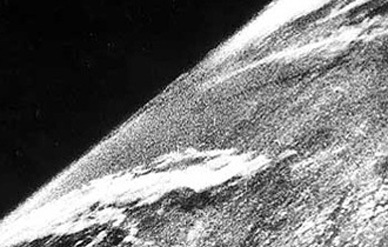 This situation only added to the so-called “shock of the century” felt by the U.S. when the Soviets launched the first satellite into orbit in 1957. Sputnik sent the Space race ballistic (pun intended). 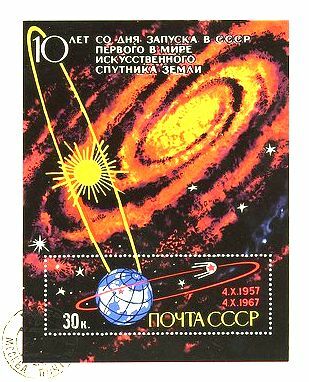 Stamp issued to celebrate Sputnik. Eisenhower wouldn’t be outdone and it was no mean feat that 3 months later a team led by von Braun, James van Allen, and Wellington boy William Pickering (yes, a Kiwi was in charge of the Jet Propulsion Unit) sent Explorer 1 into space. It was a great propaganda moment for the U.S. which NASA acknowledged at the 50th anniversary of the launch with this article on their site. At the time the 3 scientists were (reluctantly) flown from the launch site to Washington for the staged press conference where this iconic image was created. 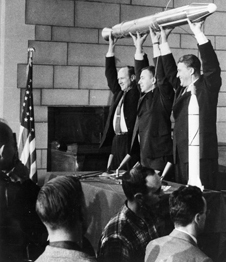 Pickering, van Allen, von Braun celebrating the launch for the cameras. The Space Race took off not because it benefited humanity or exploration, but because it benefited those who had their hands on the purse-strings. Perceptions of hegemony had to be maintained. When Yuri Gagarin became the first man in space in 1961, the Americans hit back with Alan Shepard the following month. The Soviets put the first woman up in 1963. Notably, she was also the first civilian (the U.S. didn’t feel it necessary to send a woman into space until Sally Ride went up in the Challenger in 1983). 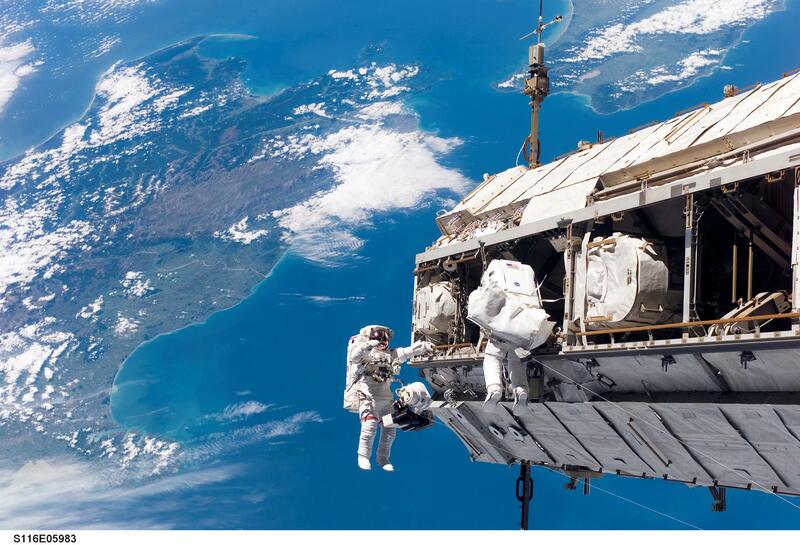 The so-called ‘exploration of space’ has been an overwhelmingly military operation. JFK only committed the U.S. to sending a man to the moon to get one over the Soviets. He saw no other value (he wrote and said this in private many times). Having campaigned on being ahead in the “missile-gap” his presidency depended on being in the lead. Gagarin went up 2 months into JFK’s presidency so he had to come up with something, anything, to top them (hence, the famous speech filled with lofty ideals). Once JFK was assassinated in 1963 his commitment became sacrosanct. Yes, it was a marvellous feat and achievement, but it had little to do with the spirit of exploration and invention that motivated the Wright brothers into the air in 1903, or sent Lindbergh across the Atlantic in 1927. Yes, the Soviets had their own missions to send a man to the moon, but once the U.S. set foot there there was simply no propaganda value in throwing any more money at it. The Apollo missions quietly suffered the same fate 3 years after Neil Armstrong fluffed his famous lines from the moon (or did he?). As I child, I followed the development of the shuttle program with great interest. The test flights from the back of Jumbo jets were played on the news in NZ. The programme, started by Nixon in the ’60s, wasn’t about human endeavour, but creating a fast turn-around vehicle to set up a space station. The so-called “space-truck” was also intended to capture Soviet satellites (Nixon approved the funding for NASA on these grounds). Yet again, it was about the Space Race. The Soviets had their own Buran shuttle programme that went up only once in 1988 but was soon abandoned as the Soviet Union fell apart. Like the landing on the moon, I watched the shuttle launches (and landings) beamed live on the telly. I am sad to see these great machines put to rest. But like the magnificent ships of the line that won Spain, then France, and finally Britain an empire, or the great fleets of exploration of Zheng He, their time has passed and there is no need to replace them. No one needs to ‘conquer’ space. The shuttle was a product of a world I am glad to see the end of. Overall, the Cold War was an obscene waste of money that may have given the bulk of society some little benefits, maybe, but they are way out of proportion to the lives and capital spent. The space-truck put some satellites up, maintained a broken telescope and provided a taxi service to the International Space Station. There was a lot of compelling live telly for those, like me, excited by such things and there are still infomercials selling products that claim to benefit from technology developed by the space programme. But I think we deserve something better than non-stick fry pans. Let me be clear, space exploration continues to excite me. When the Curiosity Rover landed on Mars last year I shared the effusive excitement of my 4 year-old daughter who squealed with wonder and delight as we watched it land. She was so intrigued when I explained what was happening that I got a poster of the solar system for her bedroom wall and a set of glow-in-the-dark planets to hang above her bed. A year later she still knows the names and special qualities of each planet. They have not been replaced by Dora or Disney or any other marker of social acceptance. Each night as I carry her to bed on my shoulders she turns out the lights so that we enter her room in darkness, with only the glowing planets to guide us. Like the Wrights tinkering away by themselves or the Dotcom giants who started off in anonymous garages and faceless dorms, the wonders of the future will come from the minds of girls and boys chipping away in mundane surroundings. Likewise, the future for space exploration lies in innovation and imagination, not in bellicose projections of state power, or ‘great (or even giant) leaps forward’. 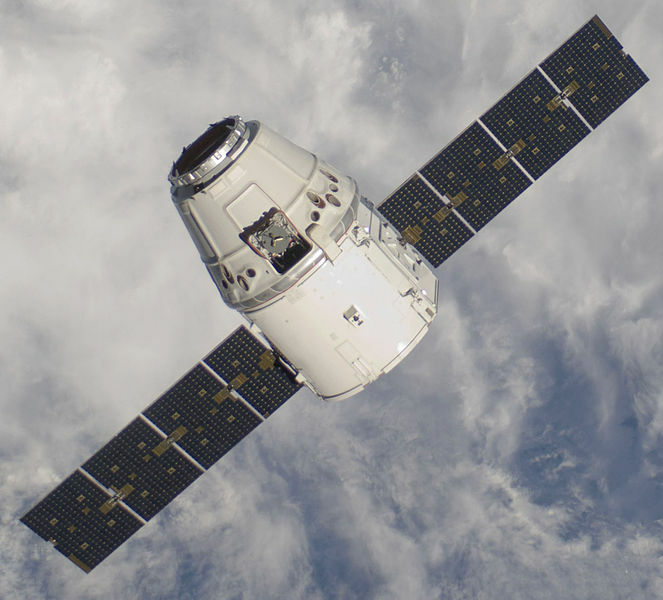 Right now a myriad of small private companies are pioneering fast turnaround re-usable craft to take the shuttle’s place servicing satellites and the space station. 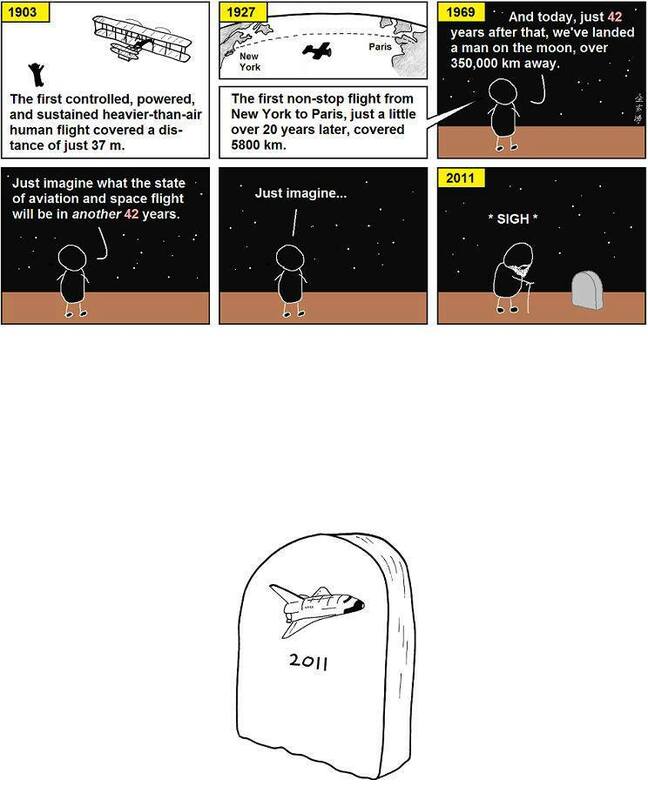 And, as always, the future belongs to those like the young stick figure in the cartoon who dare to imagine. It is not a bigger, louder extrapolation of what has gone before. As the saying goes, nothing dates faster than the future. Leave such whimsy to the realms of the Jetsons (food in a pill! ), steam-punk (I heart steam-punk!) and other fancies of a future hobbled by the past. There’s no need to grieve the passing of an imagined future. Let’s feel happy and confident enough to celebrate what has been achieved, warts and all, to take what is useful, understand what is not, and not cling to the gunships, space-trucks and eunuchs of yesteryear. Let’s sit on the shoulders of giants, imagining what may be flying overhead, in reality and in our imaginations. (Oh, and happy birthday to Orville Wright who would be 142 today, if one of the imagined futures of my childhood had come true and he was still alive). The Space Station zooming over my home.